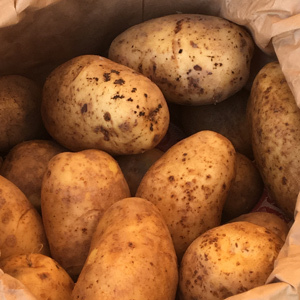 We grow 4 varieties of potatoes which are available in 25kg, 12.5kg and 7.5kg bags. Marfona is our best selling potato in bags. 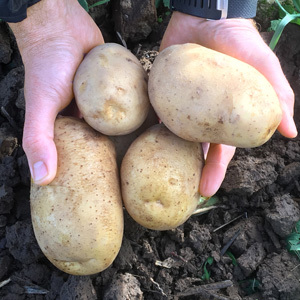 Renowned for its taste, it is a versatile table potato suitable for any use and is our own personal favourite. 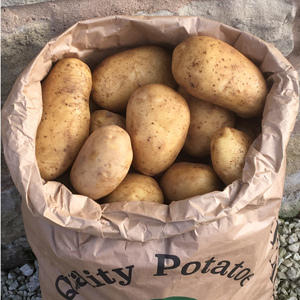 If you love chips, roasts or wedges, Sagitta is the best variety for this, giving good colour and taste, a crisp outside and light fluffy inside for the perfect chip. Mozart is a favourite of those who like beautiful looking potatoes, due to its bright red smooth skin and oval shape. A good all rounder that’s firm in texture and won't fall apart when boiled. Melody is the supermarkets' favourite, one of the most popular varieties in the UK. This is another good all rounder suitable for all home uses with a nice shape and good skin. Mozart is our Red variety. With a firm Texture and creamy flavour they are good for cooking in sauces, such as dauphinoise and great for smooth creamy mash. Marfona are short, oval shaped potatoes with light yellow skins and cream coloured flesh, with a smooth texture. Perfect for baking, Marfonas are also good for mash, wedges, chipping, boiling and cooking in a sauce. Melody are smooth, yellow-skinned potaoes with appealing pale yellow flesh. This versatile variety has a dry texture that makes it perfect as a general use potato for roasting, mashing and baking. Sagitta is a round potato with shallow eyes. It has golden Skin and a fluffy texture due to its high dry matter content. The potato does not tend to discolour on cooking. 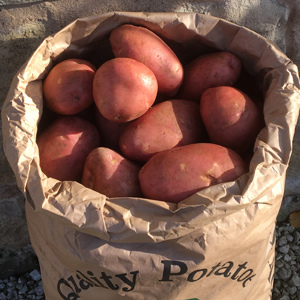 This variety is very good for chipping or roast potatoes. To achieve a crispy outside we recommmend par boiling before roasting. See our recipes page for tips on making wedges and roast potatoes. Site last updated March 2017.